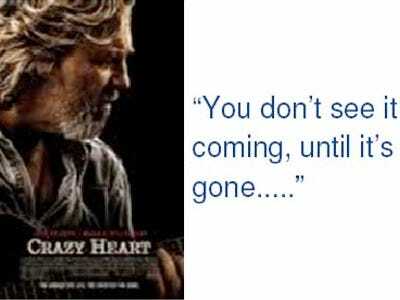 Failed Hedge Fund Ebullio: We're Like Jeff Bridges In "Crazy Heart"
They actually included this photo in their letter to investors. Zerohedge got a hold of the letter Ebullio sent out to its investors telling them to “pipe up!”Because Jeff Bridges just won an award (the Oscar) for portraying a guy who didn’t see it coming until it’s gone. So that means good things are ahead for Ebullio. Right? Award-winning performance by association. In this case, it’s = all of it. Ebullio’s Commodity Fund has lost 96% YTD. Here’s how.